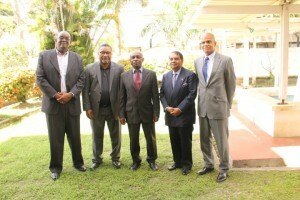 GUYANA’S NEWEST DIPLOMATS: Foreign Affairs Minister Carl Greenidge (centre) flanked by (left to right) Dr. Kenrick Hunte, Michael Tenpow, Dr. Shamir Ally and Dr. David Pollard. Foreign Affairs Minister, Carl Greenidge on Monday announced the overhaul of Guyana’s foreign service, with the hiring of several former diplomats as advisors and the recruitment of a number of others to head the country’s diplomatic missions. “This enables us to capitalize on the experiences that have been accumulated in the past in terms of policy formulation and the like and, therefore, that institutional mechanism I hope is going to help to see us through the re-establishment of what clearly was widely acknowledged as one of the most effective, if not outstanding, foreign services in the Western Hemisphere,” he said. The Ministry of Foreign Affairs’ advisory team includes former Foreign Affairs Minister, Rashleigh Jackson and Ambassadors, Ronald Austin Timothy Critchlow, Rudy Collins and Cedric Joseph. Austin is tipped to be Director of the Foreign Service Institute. While in opposition, the People’s National Congress Reform and its offshoot – A Partnership for National Unity (APNU)- had repeatedly accused the then People’s Progressive Party Civic (PPPC) administration of destroying the foreign service since it had come to power in 1992. Addressing the new recruits at an orientation seminar at the Foreign Service Institute, Greenidge also emphasised the need for foreign service officers to be able to analyse daily issues in a fast-paced information-driven global environment. “I want the Foreign Service of Guyana to be a foreign service that recognises that it will have to be adaptable, it will have to develop skills many of which might lie outside of the traditional diplomatic arena,” he said. The Foreign Affairs Minister noted that core staff does not necessarily have to be interested or qualified in International Relations, but there are other disciplines that can also help them deliver a better quality of service in an era where diplomacy includes other disciplines. “Today you have to understand and come to grips with a range of issues and each officer should try and have one area of competence outside of general diplomacy so that when you come to the table you bring some specific skills,” he said. The orientation exercise focused on the expectations for Heads of Missions, the role of the mission in promoting investment and trade, border issues, consular matters, Caricom and regional integration, terrorism, the environment, the importance of technology and Guyana’s tourism potential and anti-money laundering procedures, among others. The participants included High Commissioner to South Africa, Dr. Kenrick Hunte; Permanent Representative to the United Nations, Michael Tenpow; Ambassador to Kuwait, Dr. Shamir Ally; High Commissioner to the United Kingdom, David Pollard and Ambassador to Belgium, David Hales. Absent was Ambassador to Trinidad and Tobago and the Eastern Caribbean, Cammie Ramsaroop.